Washington - He took a fist-pumping victory lap over the end of the Mueller probe. Basked in gushy accolades from a foreign leader. Saw a former nemesis humiliated by the feds. Trump started his day firing off exuberant tweets over the end of the special counsel investigation , segued to a back-slapping meeting with the Israeli prime minister and held a celebratory photo-op with the Stanley Cup-winning Washington Capitals. To top it off, news broke along the way of the arrest of attorney Michael Avenatti. As is his habit, the president woke early and turned to feeding his Twitter account just after 6 a.m. There was no venting or heckling on this particular morning. Instead, he was eager to celebrate on the day after his attorney general issued a summary of special counsel Robert Mueller’s investigation that found Trump’s campaign did not collude with Russia to swing the 2016 presidential campaign in his favor. Trump’s big day was just getting started. After aides roundly excoriated Democrats and journalists — two of Trump’s favorite targets — on morning news shows, the administration turned to welcoming Israel’s Benjamin Netanyahu to the White House. 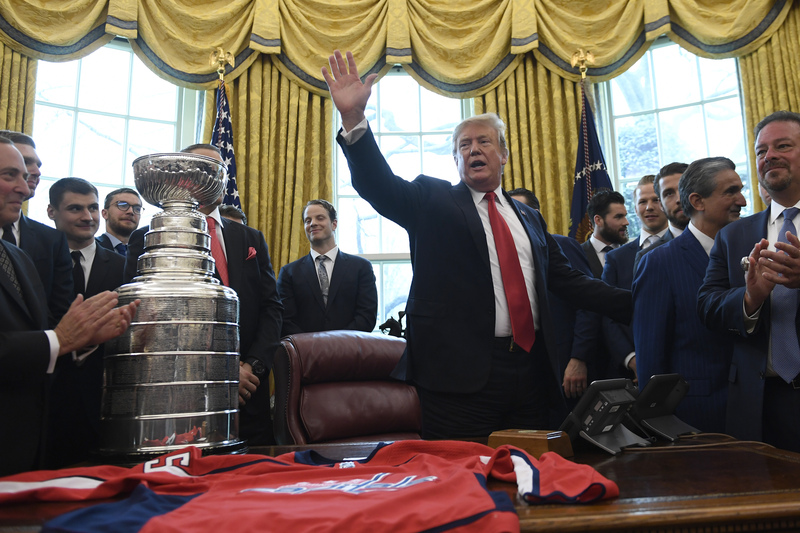 Trump capped off his day by welcoming the Capitals to the Oval Office, joking back and forth as he sung their praises and reminisced about watching hockey great Bobby Orr play with the Rangers. This is just simply unbelievable,how so much good news is overflowing on President Trump,after being treated so horribly the past two years. And leave it to PM Netanyahu to find himself in the middle of it all! This is so much better than a movie! Gateway Pundit) – MSNBC is struggling through the stages of grief right now following the news on Friday that dirty cop Robert Mueller will put forward no more indictments in the Trump-Russia witch hunt. They’re about to hit the rage stage. So why did the trump people lie about their meetings with the Russians? Why hide the Mueller Report? Why hide trump's tax returns? Why love trump? For his racism and hate speech! Dems and media keep it up and trump will win in a landslide. Almost as if even he was surprised. Congrats, Mr.President on a well deserved win, with many more to come !!! Does Hallmark have a card for this? well after the leftist media have been pumping us with stories of Russian collusion as if it were totally real, and an ongoing investigation for two years that seemed to clinch the given fact that Trump was so very obviously guilty, the news came down as if from heaven to clear Trump. Of course he should be happy! You are a fool and ask dumb questions. 2) if those things are made public you guys will pounce on the one litle gotccha moment that everyone has especially when things are complex. So we won't give you fodder. Re The Mueller report. There are certain DOJ laws and regulations plus natonal secuirty concerns. You simply can't make the whole report public. But 420 congressmen/women signed to make whats feasable public. Rod Rosenstein is no trump puppet at all. Trust me he will make public what he can. If Iw ere you I wouldn't bet on finding much from making it public. Re racism? Nonsense. Trump has done more for blacks than many presidents prior. Did you forget that he signed a law for early release of low level drug offenders not too long ago? Do you mean his anti islam hate? Well rightfully so. Muslims chant death to america and killed us on 9/11. The NYC Daily News which hates Trump, (and even had a photo of him on the front page, after the 2016 election, stating "The Clown Wins"), actually complimented Trump, with the headline "TEFLON DON".